passion for reality show cooking competitions. Not just here in the States, but in the UK (where it originated), Italy, Australia, India, and in numerous adaptations of the show internationally. With chef Gordon Ramsay bringing the heat as host and judge here in the US, along with chef Graham Elliot and restauranteur Joe Bastianich (although pastry chef and Momofuku Milk Bar owner Christina Tosi will soon be taking over his duties as judge), all signs point to America’s favorite kitchen (as the show’s opening credits boastfully proclaims) keeping it real hot in the kitchen for some time. It’s no secret that Ramsay is the reason why so many remain enamored with MasterChef (and now with the cute as all get-out MasterChef Junior). Majoring in sh*t-talk and excelling at dropping F-bombs like buttermilk biscuits at aspiring chefs in all of his restaurants and reality show kitchens, Ramsay had fans quivering in fear over the prospect of him possibly spewing off one of his expletive-driven rants at (clutch the pearls, no!) one of the kiddie cooks. By Ramsay’s account, he absconded without uttering a one. But don’t ya just love kids and their honesty? A couple of the small-fry chefs checked the big, bad chef on that false claim real fast. It makes you wonder what other goodies and juicy tidbits are floating around in the cavernous kitchens of MasterChef, doesn’t it? With as many kitchens as they have around the world, one would expect to find deliciously dark and juicy secrets hovering around every corner, just waiting to be discovered and shared with the world. Well, they were, uh, maybe not so dark, but all of them were very juicy. Here are 21 secrets about the MasterChef franchise that you had no idea were going on. — until now. 1. Cooking contestants are given cooking classes. What? You don’t know how to make a souffle or bake a custard, you say? No worries…there’s a cooking class for that. A former contestant (obviously not the winner) called out Ramsay and crew a little over a year ago for cooking up lies, by making participants take cooking classes to make their food look oh-so-purty. MasterChef runner-up from season 3, Josh Marks (RIP) commented on the classes as well. Everyone should know at this stage of the game that there’s virtually no reality in reality shows. Cooking shows are certainly no exception. Even so, we as the viewing public like to be fooled and feel like the challenges on MasterChef that the home cooks face are authentic and relatable, and we feel the stress and anxiety that each contestant is going through during every stolen moment of the time clock. Even though many of the dishes that they seem to whip up off the tops of their heads are strikingly gorgeous and appear restaurant ready already, don’t they? Hmmm…. 2. Kids handle the stress of losing better than the grown-ups. Kids are resilient. They’re able to bounce back like nobody’s business. This was totally the case with the kids on the set of MasterChef Junior. The psychological trauma that can come along with losing a competition is taken seriously whether it’s a child or an adult. But according to Robin Ashbrook, MasterChef and MasterChef Junior executive producer, the youngin’s handle the loses so much better than the big kids. With some of the adults seeming to need a therapist after being asked to leave their precious aprons on their station before they get the boot. What’s that saying…the bigger they are, the harder they fall in the kitchen? 3. Changing your job is a given. If you were a teacher before you entered and won MasterChef Australia, you can forget about going back to it. Or your job as a lawyer. Or as the IT guy, er … person. After five seasons of the show, not one winner has returned to their old grind. In fact, 70 percent of finalists choose a career in food after competing on the show. So if you’ve been thinking about a career change, appearing on MasterChef is the place to get ‘er done. 4. Love was on the menu on the UK’s Celebrity MasterChef. Her cooking must have been off the chain. English actress and celebrity contestant Lisa Faulkner (who is also a chef) won Celebrity MasterChef in 2010 and apparently the heart of MasterChef judge John Torode. Remaining “friends” after the competition, both chefs eventually hooked up after going through breakups and eventually divorcing their respective partners. The love hasn’t burned off yet by any means, with both recently being seen out together at a red carpet event. 5. MasterChef Logan Guleff always wears a bowtie. Who can forget little Guleff, winner of season 2 of MasterChef Junior? Ramsay certainly seemed to take a shine to him. And surely no one’s forgotten about the cute little bow ties that he would sport in every episode. He’s been wearing bow ties since his godmother’s wedding and he hasn’t looked back. Well…maybe just for his mom to come over and tie them for him, since he doesn’t know how to tie the fancy schmancy bow himself. 6. Don’t worry if you see kids crying on MasterChef Junior, because Ramsay says it’s “healthy.” Is it really a surprise to see Ramsay play psychologist on the side to kids who are more than likely crying over something that he said or did to them? Maybe not. 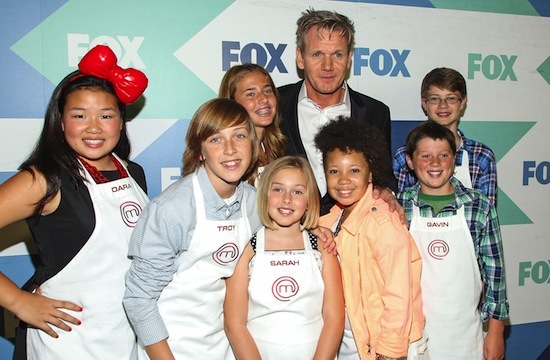 But Ramsay recently revealed on a panel that he’s totally OK with kiddos crying on MasterChef Junior because it’s better than the kids “bottling it up.” “No one walks down the corridors with insecurities,” Ramsay said during a recent TCA panel. “I think crying is healthy. I cried before Christmas, watching my 30-year-old daughter get upset over her scrambled eggs.” He is a father after all, isn’t he? So perhaps he’s just giving all of us a little fatherly advice. Or perhaps he’s actually prepping us because there’s sure to be more kiddos crying their little eyes out in cooking competitions to come.